The Spanish Government today, Tuesday deported 23 Nigerians for committing various offences in the country, the News Agency of Nigeria (NAN) reports. 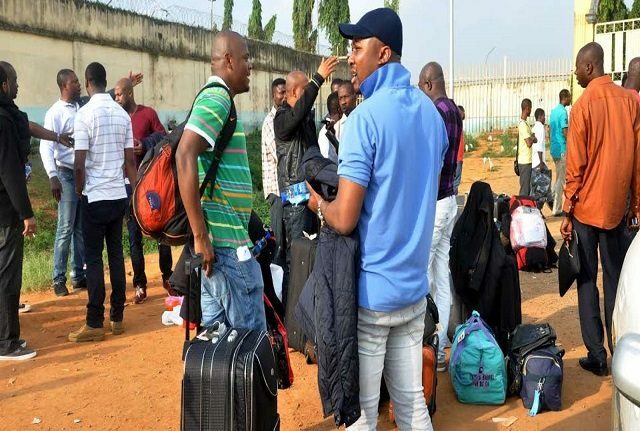 They were deported barely five days after 34 Nigerians were sent home from six European countries for committing immigration-related offences. Reports suggests that 34 Nigerians were jointly deported by six European countries on June 22 for committing immigration-related offences. The deportees were sent back home from Switzerland, Germany, Iceland, Austria, Belgium and Hungary. It was also gathered that the new set of deportees arrived at the Murtala Muhammed International Airport (MMlA) Lagos, at about 6.40 a.m on Tuesday. The new deportees, comprising 21 males and two females, were brought back in a privilege style aircraft with registration number EC-IZO. DSP Joseph Alabi, the spokesman of the Lagos Airport Police Command, confirmed the development. Alabi said that the deportees were received by officers of the Nigerian Immigration Service (NIS), the National Agency for the Prohibition of Trafficking in Persons (NAPTIP) and the Police. He said that others also on ground to receive them were officials of the Federal Airports Authority of Nigeria (FAAN) and the National Drug Law Enforcement Agency (NDLEA). According to him, 9 of the deportees, who were deported for drug-related offences, were handed over to the NDLEA. He said that two others, who were deported for criminal offences, were handed over to the police. Alabi said that the remaining 12 deportees, accused of breaching the country’s immigration rules, were profiled and allowed to go to their respective destinations.